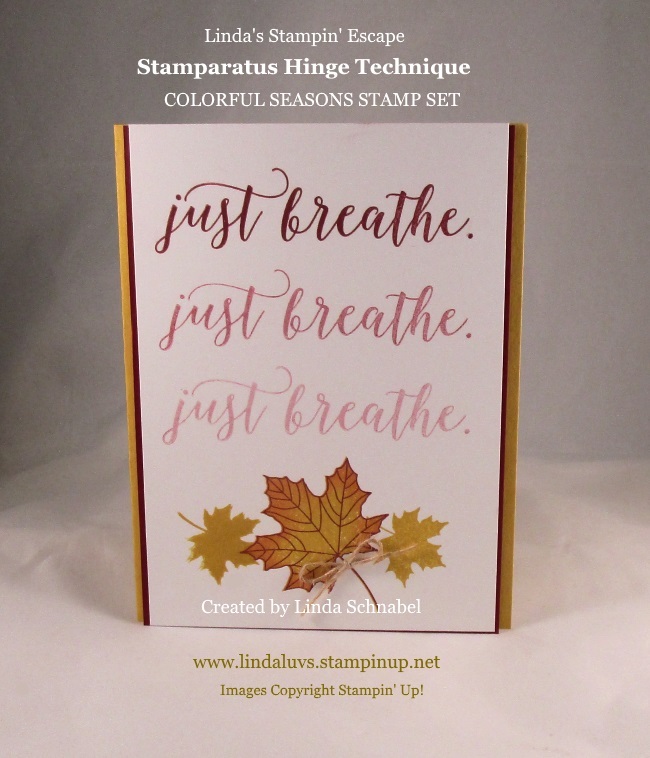 New Product Line: Storage by Stampin’ Up! 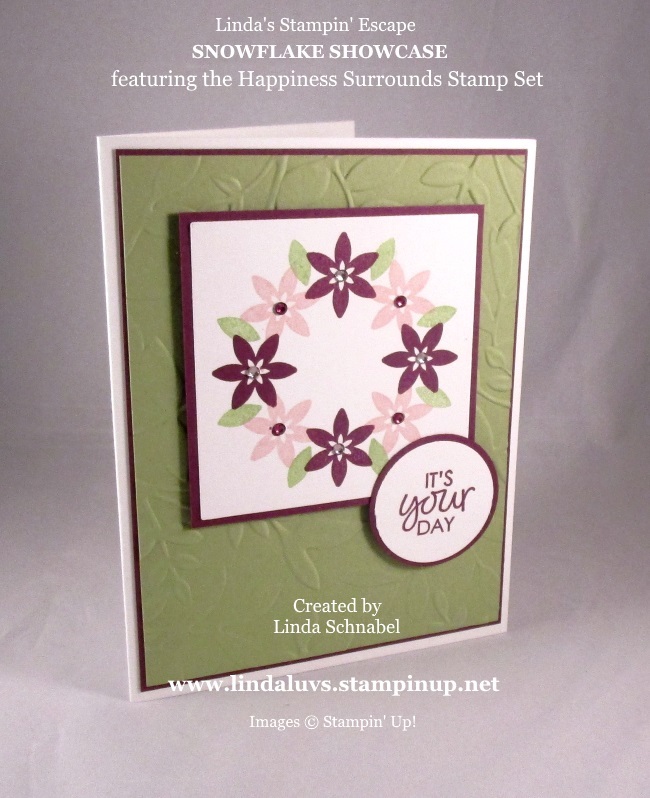 I’m so excited to announce that, on April 1, Stampin’ Up! is launching a new product line called Storage by Stampin’ Up! Whether you have an entire room or a small corner in your home for stamping, our new lineup of modular storage solutions lets you organize—and customize—your space your way! Also … I just want to remind you that we only have a few more days before Sale-a-bration ends. If you were looking at making a purchase, now’s the time to get additional FREE product. Here’s my suggestion and my favorite tool, the Stamparatus! Message me with any of your questions, plus I’d love to hear what you think of the new Storage by Stampin’ Up! I’m so excited … I’m doing a little rearranging of my craft room so now I can have all my inks and markers and more right at my fingertips!! I’ll be sure to share the before and after photos … of course I have to wait till April 1st, just like you. Thanks so much for spending a part of your day with me. 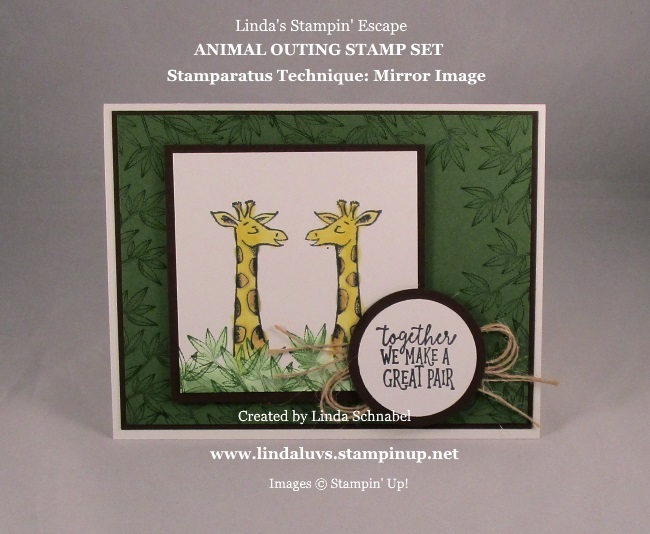 Today I’d like to share yet another card that I created with the help of the Stamparatus and the Oh so cute “Hand Delivered” Hostess stamp set! Yes, this is one of our exclusive stamp sets for those who host a stampin’ party or purchase enough to qualify as a hostess. You can also have a book party too … just pass the catalog and let your friends & family pick out what they need … Remember, it’s Sale-A-Bration so each $50 (before S&H) purchase qualifys for a FREE Sale-A-Bration item. Get Well cards are requested all the times, and this stamp set is so sweet. When deciding how I was going to create my card, I decided to “send” flowers with it, in the form of our designer paper … the stunning Petal Promenade Designer Paper. The pattern I used had a lot of the Blackberry Bliss in it. 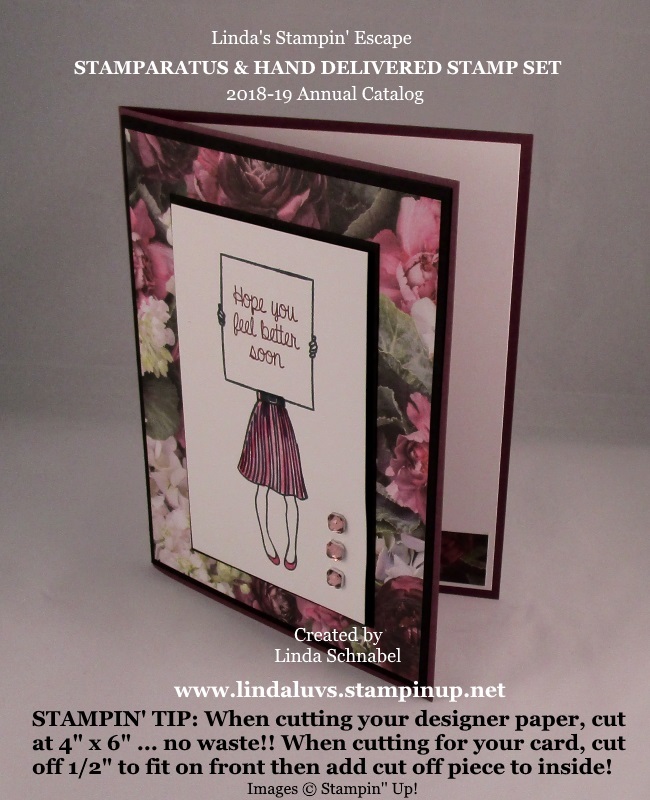 I did the “Happy Dance” when Stampin’ Up! brought this back! When I cut my designer paper, I cut it in 4″ x 6″ pieces and use it for card fronts … I just cut off 3/4″ off the 6″ edge so I end up with a 4″ x 5-1/4″ … think I printed that wrong on my photo!! But you can see I tucked it in the inside to decorate that too. The coloring and the greeting were all done in Blackberry Bliss and I couldn’t resist using the new Petal Pink Rhinestone Gems … the compliment the Blackberry Bliss so beautifully. Don’t forget that when you are working with a Photopolymer stamp set on the Stamparatus, you will need to use the foam mat this is included with the Stamparatus. I always have my Silicone mat underneath … just always have it there! Here are a few more samples that were created with the Hand Delivered stamp set …. 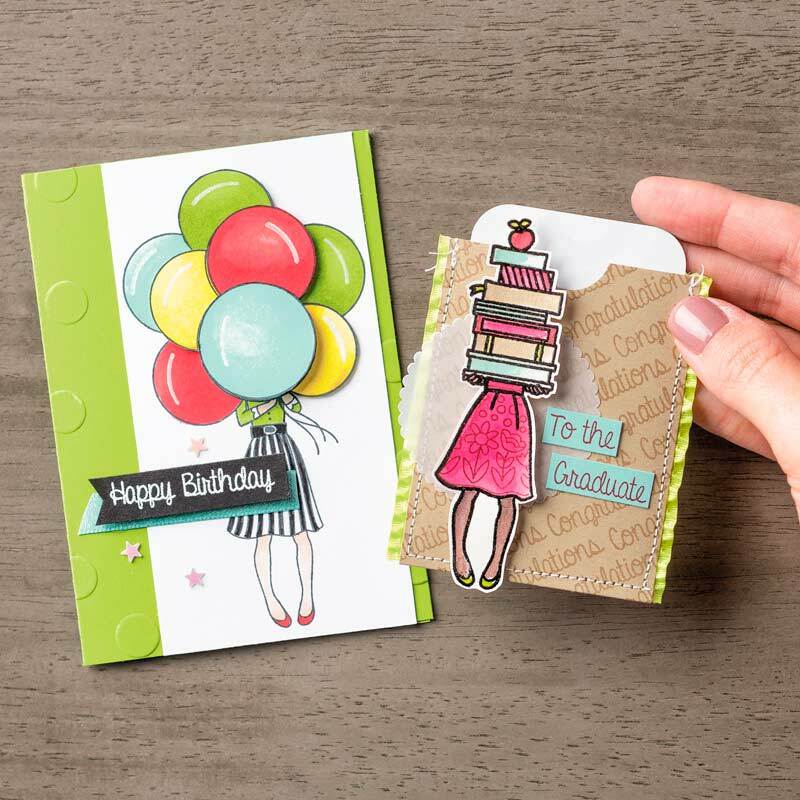 The Hand Delivered stamp set just stole my heart, and I hope that you enjoyed the samples shared today. This maybe an exclusive Hostess stamp set but just by passing the catalog around, hosting a stamping party of purchasing enough to qualify as a hostess, it can be yours too. Thanks for hanging out until I got my blog posted today … I appreciate your loyalty and patience. Yesterday I shared a video with some great tips while using the Stamparatus, today I’ve got a cute card for you that features a fun technique by using the Stamparatus!! 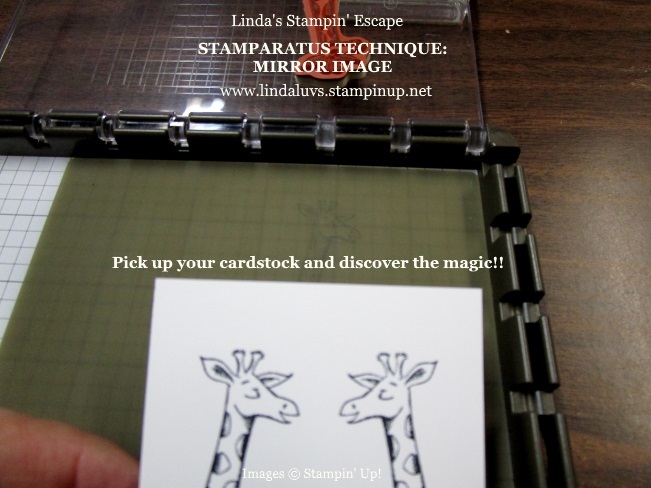 I’m going to show you how easy the “Mirror Image” technique is … and with the precision stamping of the Stamparatus, it makes it super simple!! The first thing you want to do is set up your placement of the stamp. You will place your stamp on your piece of cardstock “where” you want the stamped image. Once it’s placed properly, bring your plate (you can see it above our stamp) over the stamp and press firmly to pick it up. You do this just as you would on your blocks. Here you can see that I brought the plate down over the stamp and with my finger I put a little pressure on the plate to pick up the stamp. 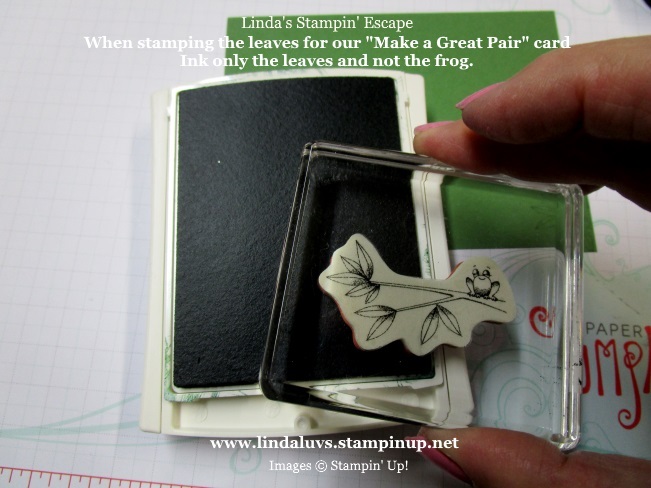 Once you have picked up the stamp … you will flip the plate back up and ink up the stamp with Momento ink. Do not use StazOn … it’s permanent ink and will remain on your silicone pad. I always give my stamp a firm little push to make sure the paper is picking up the ink. 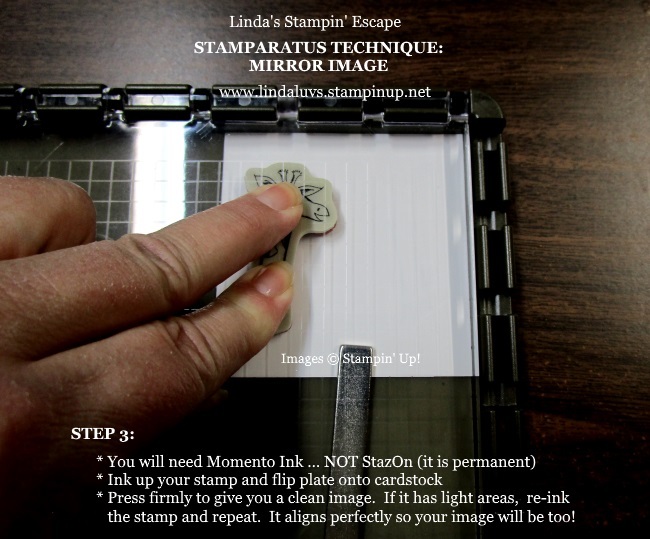 You can always re-ink and re-stamp … because the Stamparatus is a stamp positioner, it will stamp directly in the same spot (as long as you are not moving your cardstock). Once you’ve stamped your image to your liking … It’s time to remove your cardstock. Get your Momento ink and ink up your stamp again and stamp directly onto your Silicone mat. You will want to ink up the stamp and stamp the Silicone pad several times so you have “good” ink coverage. When you have a nice layer of ink on your Silicone pad … get your cardstock again. 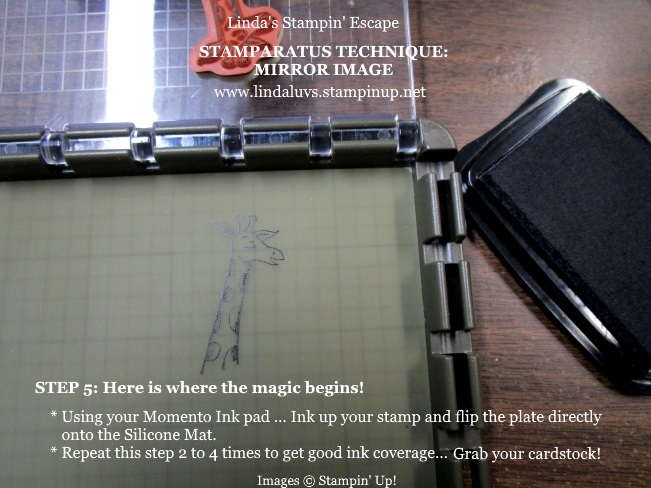 FLIP OVER THE CARDSTOCK so the image is placed against the silicone pad … you should not see any stamping on your cardstock. 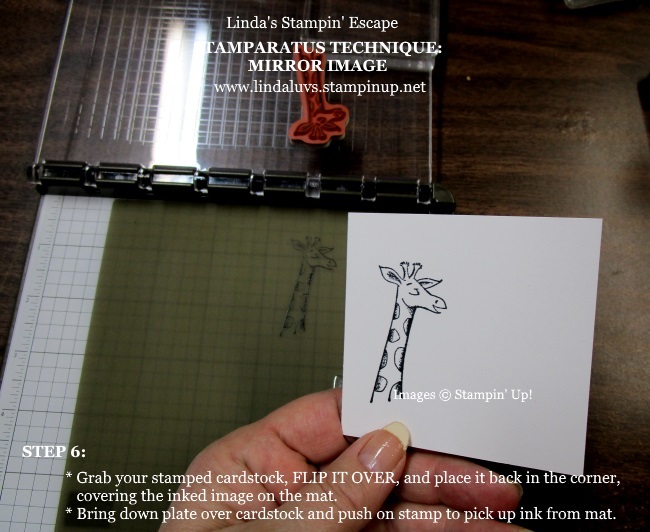 Tuck the cardstock back into the corner of your Stamparatus, then bring the plate over your cardstock and apply pressure to the stamp so you pick up the ink on the silicone pad. The picture would look exactly like STEP 3. If you look closely you can see a very light image left on the silicone pad … most of the ink is now on your cardstock and you have created a mirror image! Wasn’t that easy!! Because there is a little froggie sitting at the end of our branch, we simply inked only the leaves. These were stamped on the Garden Green to create the background, and then again as foliage around our giraffes. After we stamped the leaves around our giraffe, we used the Aqua Painters to pull the color from the stamped image to color itself … isn’t that cool!! 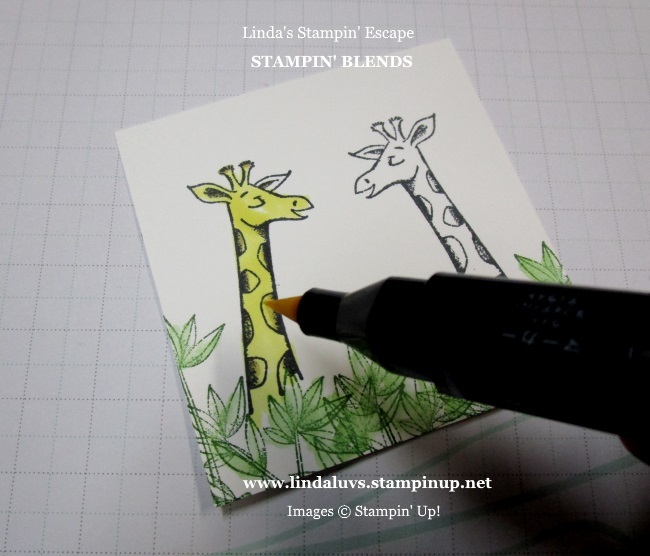 We used the Stampin’ Blends to color our giraffe … the Light Daffodil Delight and the Light Crumb Cake for the spots. You’ll see this better on the finished card. Here you can see the Crumb Cake on the spots and the leaves stamped to create the background. I did that technique a lot before Stampin’ Up! gave us so many amazing designer papers. The greeting also comes from the stamp set and was punched out with our circle punches. All of our stamped cardstock was backed with Early Espresso cardstock. I finished off the card with strings pulled from the Burlap ribbon. I just adore this card, and we had a great time making it … because it was so easy to do. The ladies were pleasantly surprised and oh so happy that they could create this card with ease. Hope you enjoyed it as much as we did. Thank you for joining me today. Please message me if you have any questions about the Stamparatus or the Mirror Image Technique. If you like the card you saw today, I have the items listed below. You can click on any item to learn more about the product or to begin your shopping. Remember, for each $50 you spend, you may choose a FREE Sale-A-Bration item and get a Virtual Rewards point from me!! I think by seeing the Stamparatus in action, it will actually bring my words to life and help you better understand my step by step tutorial. For example, not getting it stamped fully on the first try, it’s easily fixed by re-inking the stamp and stamping it again … perfection! 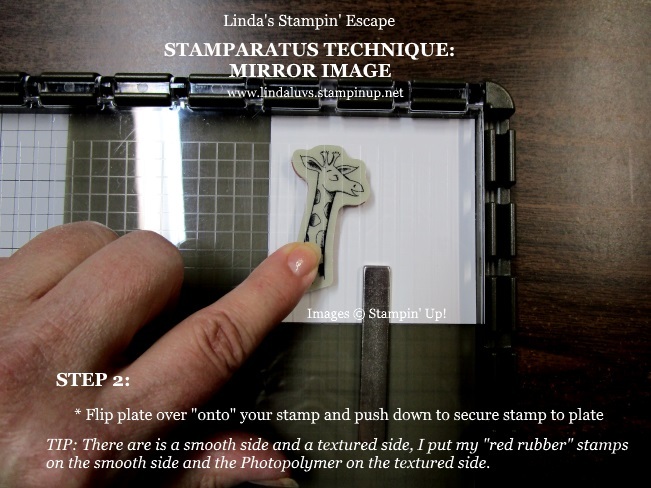 Hope you enjoyed this video on our Stamparatus, it is a great addition to your stamping tools. 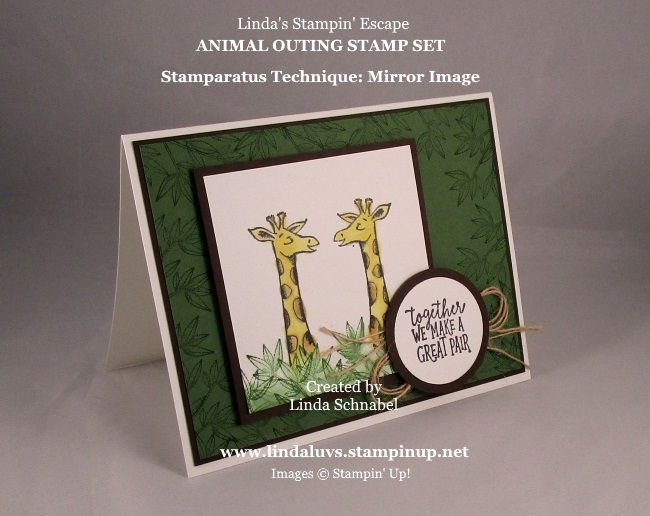 Stop back tomorrow as I will be sharing another cute card and amazing technique using your stamparatus. 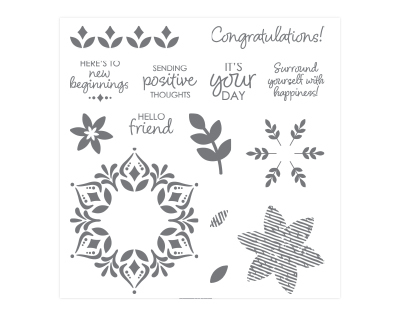 The stamp set is the Happiness Surrounds Photopolymer Stamp Set. This set also coordinates with the Snowfall Thinlits Dies. The background was embossed with the “Layered Leaves” Dynamic embossing folder. This is one of my favorites because it goes with so many different stampin’ styles. The floral wreath was done in Pink Pirouette and Rich Razzleberry with a touch of Pear Pizzazz … these colors were also used in my cardstock layers. We used a template created to make our wreath and with the Stamparatus the flowers are inked and stamped in perfect placement. Each of the flowers has a Rhinestone but to jazz it up we colored the rhinestones to match the colors we used, but put the opposite colors on the flower … so light on dark and dark on light. Greeting is also included in the stamp set and was simply stamped in Rich Razzleberry on Whisper White and was punched with our circle punches. 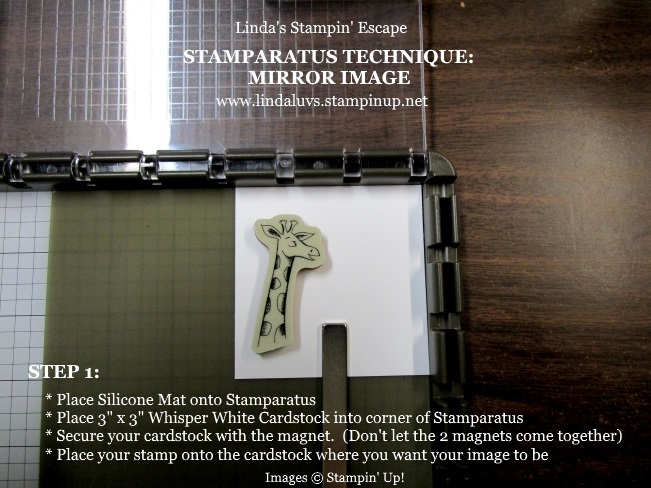 With the use of the Stamparatus … this card is super simple to make. I’m hoping to have a video for your soon. Thanks for hanging out with me today. 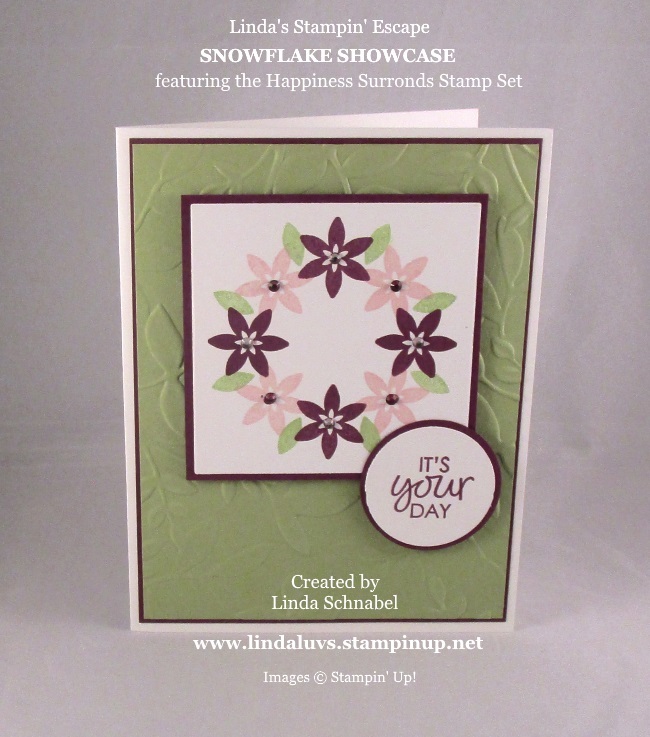 TODAY’S STAMPIN’ SUPPLY LIST … Last 2 days to purchase the Snowflake Showcase products. Hope you had a good weekend and I hope you enjoyed my card yesterday from our Country Lane Product Suite. 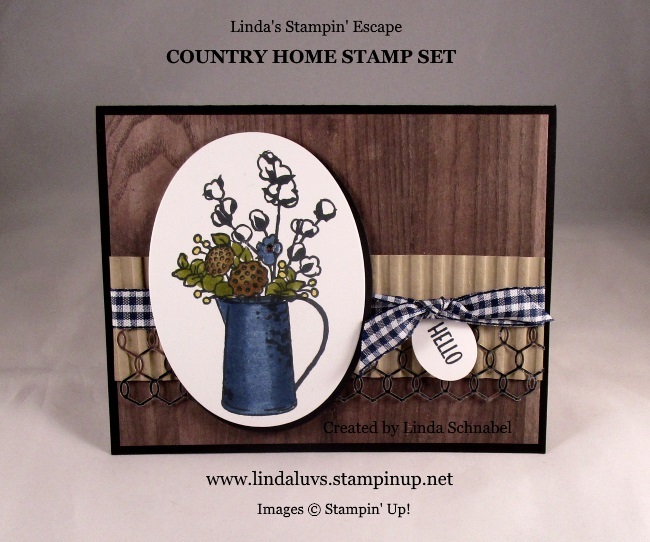 If you haven’t had enough … then I have another card to share with you that features the Country Home stamp set. Many moons ago before I had my children I used to work in a flower shop, and this card takes me back to the late 70’s when dried flower arrangements were popular and so was arranging them in pitchers & coffee pots … a little bit country! What’s interesting is that I have one of those mini blue tin coffee pots on my stove right now!! I wanted this card to be a bit more rustic since yesterday we had the galvanized background, so I started with the Wood Textures Designer Series paper stack (I love browns and blues together). I wanted to add some texture so I used a 1-3/4″ x 5-1/4″ piece of Crumb Cake and ran it through the Corrugated Dynamic embossing folder. Next I added a strip of the Chicken Wire Elements and added the beautiful new Night of Navy Gingham Ribbon… this ties the two elements together without leaving a harsh edge. Then I tucked my sweet little “hello” onto the card. 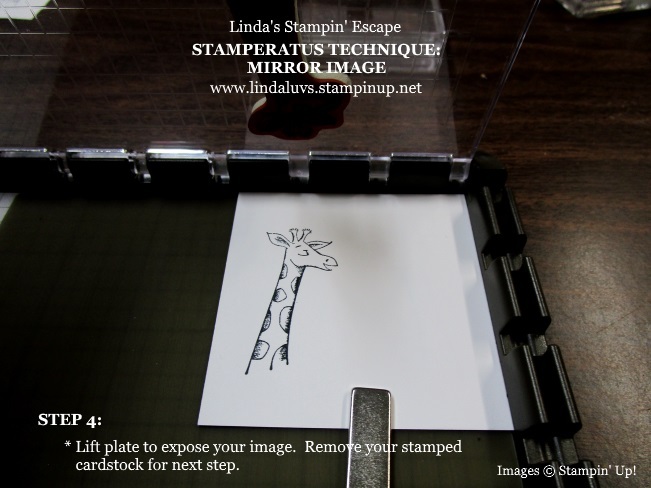 I used the Stamparatus again to stamp my images…. one of the reasons was because I had precut the ovals and then placed them in a template, this is a true paper saver. 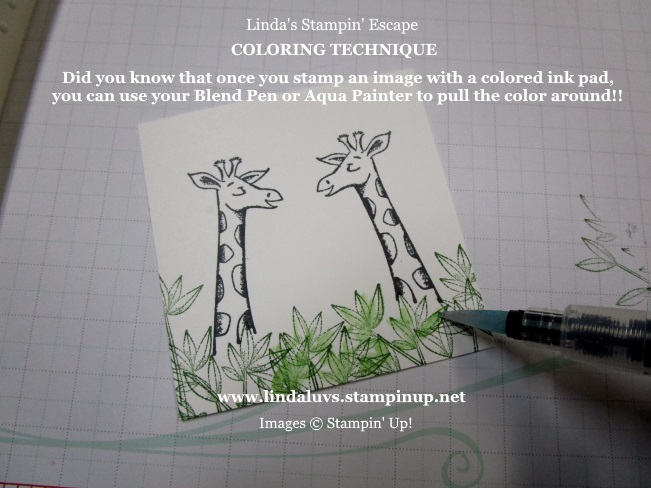 Just like yesterday, I used the Stampin’ Blends – the alcohol markers. I colored the sides of my coffee tin with the Night of Navy first, then filled in the entire pot. I used the Color Lifter to lighten the center and create my “light source” … where the light would hit your object. I did the same with all my colors, started with the dark and colored over with the lighter shade. The berries were colored yellow (Yellow and Blue are for our Brewers!!) And Marge … if you are reading this, please give me a call. I colored the center flower in Night of Navy and again used the Color Lifter, after which I added a touch of the Wink of Stella to the flower and the light area of my coffee tin. 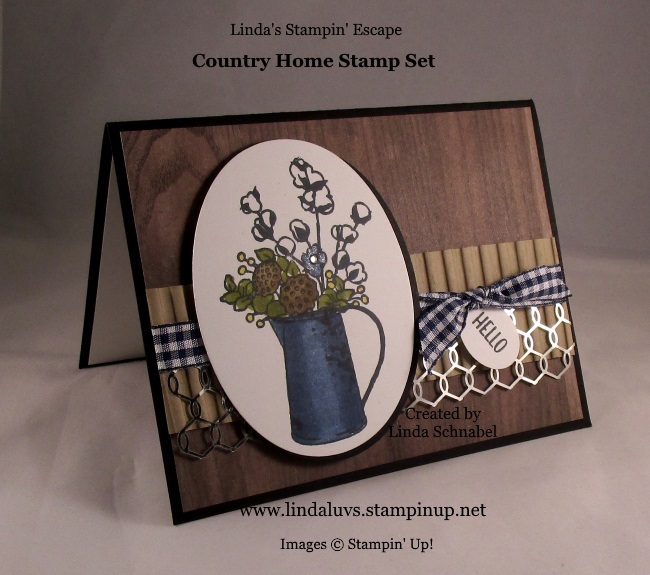 This stamp set and the cards I have created brought back many memories, whether they were of grandpa’s farm of working in the flower shop … it was a nice stroll down memory lane. Thanks so much for coming with me … Let’s kick off this week with a warm hello. TODAY’S STAMPING SUPPLY LIST … if you like what you saw, you may purchase any of the items used to create this card by clicking on them. Thank you.